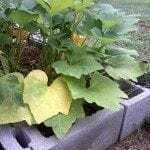 My leaves are turning yellow and my squash are drying up on my squash plant. The leaves also have a white mold on them. Anyone have a solution?